What is a Gearbox and What does it do? Bicycle gears Increase speed: If you connect two gears together and the first one has more teeth than the second one, the second one has to turn round much faster to keep up. So this arrangement means the second wheel turns faster than the first one but with less force. Change direction: When two gears mesh together, the second one always turns in the opposite direction. So if the first one turns clockwise, the second one must turn counterclockwise. You can also use specially shaped gears to make the power of a machine turn through an angle. In a car, for example, the differential (a gearbox in the middle of the rear axle of a rear-wheel drive car) uses a cone-shaped bevel gear to turn the drive shaft's power through 90 degrees and turn the back wheels. To be very precise, Gearbox is a mechanical device used for torque increase/decrease via speed reduction/increase. It consists of two or more gears with one of the gears driven by the motor. The output speed of the gear box will be inversely proportional to gear ratio. Gear Boxes are typically preferred in constant speed application like conveyors and cranes where it can provide increase in torque. Transforms motor high speed, low torque to low speed high torque (nothing for free even at X-mas time). Low speed/high torque to high speed/low torque. Sometime, the "gear head" runs on a timing belt or chain with the gear ratio 1:1 and is used to reduce the motor vibrations transfer to the load. Often overlooked - gear head reduces the inertia of the load as seen by the motor in the ratio of square of the gear ratio. Eg. 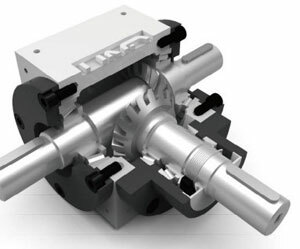 if you install gear head with ratio of 4:1, 2000 rpm is going to be concerted to 500 rpm but the inertia of the load is going to be reduced 16 times. If you use a worm gear it ads self-locking mechanism to the system (you can't move the load until the motor spins). There is couple other with own peculiarities (like eg. ball screw which is also gear head but we typically do not refer to them as gear heads). Note also that gears do not run for free which means you are losing the output power which means, gear has certain efficiency. There are various type of gear heads: spur, planetary, one stage, multiple stages, harmonics, spur-epicyclic, (cycloidal), worm etc and combination of the above but this is a whole, separate science.